Every time an arts organization tells me their plan to attract new audiences consists of discounting tickets, this is the image that pops in my head. Especially when "new" = "younger"
There's no doubt that discounts are a useful tool. Essential, even. 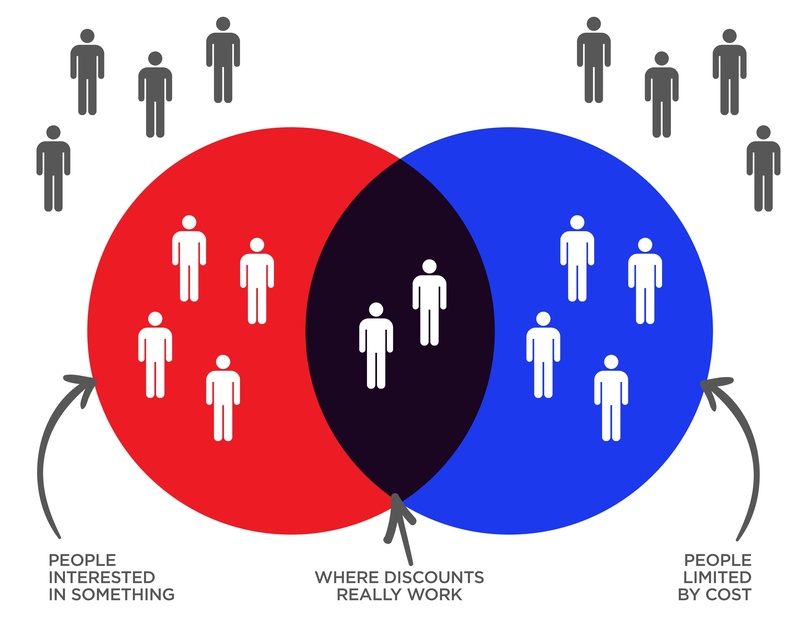 There are many people in that purple zone above—where people are already interested in the product, but limited by cost. That's where discounts (and free tickets) do their job well. Discounts are definitely a good thing, but they are only part of the picture. Discounts work best when the audience is already interested...when someone already values the product. Cutting a price doesn't have impact if the product isn't valued. This is true for Millennials, just like it's true for every other generation. It's not a unique situation for people under a certain age. If you make the assumption that all you need to do is lower prices to attract a new audience, you're making the assumption that the new audience is already interested in what you're doing and places value on it. Think of the circles. And outside of them.